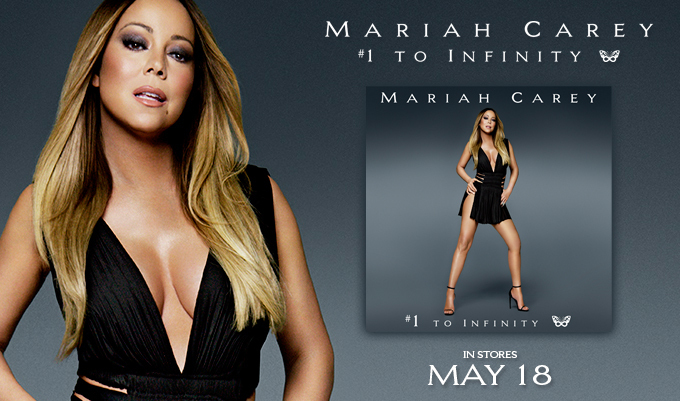 Mariah Carey To Release #1 To Infinity On May 18! Multi-platinum global superstar Mariah Carey has been signed to an exclusive contract with Epic Records, a division of Sony Music Entertainment, it was announced today by Antonio ‘L.A.’ Reid, Chairman and CEO, Epic Records. Mariah now returns to Sony Music where her hitmaking career began, with a history-making string of 18 Hot 100 #1 hits that made her the best-selling female artist of all time. Mariah’s first album release will be Mariah Carey #1 To Infinity, arriving in stores May 18th on Epic Records / Columbia Records/Sony Legacy. For the first time ever, one career-spanning chronological collection will gather all 18 of her Billboard Hot 100 #1 singles (17 self-penned), more than any solo artist in history. Included as the final track on the collection is Mariah’s breathtaking new single, “Infinity” (co-written and produced by Mariah). Fans who pre-order the album now will receive a special gift. “MARIAH CAREY #1’s,” her headlining residency at the Colosseum at Caesars Palace in Las Vegas, will kick-off on May 6th, in between the release of “Infinity” and Mariah Carey #1 To Infinity. For the first time ever, Mariah will perform all 18 of her #1 hits in one production, designed exclusively for the Colosseum, also featuring fan-favorite album cuts, never-before-performed songs, and other surprises. Presented jointly by AEG Live and Caesars Palace, tickets to the first 18 performances in 2015 are on-sale now: May 6, 9, 10, 13, 16, 17, 20, 23, 24; and July 8, 11, 12, 15, 18, 19, 22, 25, 26. To purchase tickets, go to: thecolosseum.com or axs.com.